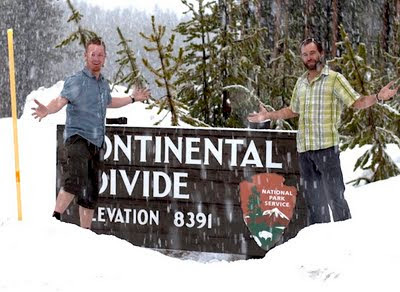 Welcome to the race updates blog for the memorable 2011 Tour Divide. Lots of interesting developments are at play. Record La Nina conditions fracture the traditional Grand Depart, scattering ITTs across the entire season. Fires again threaten NM. The first ever Antelope Wells Grand Depart is formed; new CDNST singletrack makes it's debut. It will be quite the season for adventure on the GDMBR. Tune in below for periodic commentary from Paul Howard (TD`09), Jon Billman (TD`10) and Matthew Lee, reluctantly sitting Divide racing out for the first time since 2004. Submitted by High Country Lodge on June 10, 2011 - 4:55pm. With record snow and flooding thoughout Montana this years TD will be more difficult than ever. We usually saw the first TD rider (Matthew Lee) come by our lodge on the 5th or 6th day. I am sure the snow and flooding will slow the pace this year. Good luck to all and safe riding!